Enter The Sunken City A Second Time! Most find death in the crumbling ruins that stretch beyond sight into the mists south of the Great City; once rich districts now claimed by swamp and dark denizens. But for the desperate folk of the city, the ruins offer treasures the Great City denies them: fortune, glory, and a fighting chance! Do you dare re-enter the deadly swamps of the Sunken City? The hamlet of Slither’s End needs your aid, but after meeting the bizarre locals, you might wonder if you need someone to protect you from Slither’s End! Can you unravel the mysterious abductions plaguing the town? Do you chance trekking through the open swamp seeking answers when death lurks around every bend? And who is this Jonas Gralk that everyone mentions with grave suspicion? 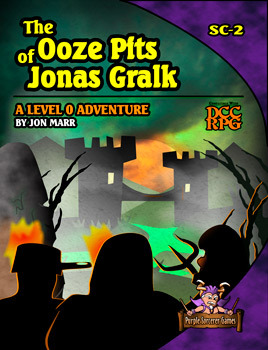 Answers await in The Ooze Pits of Jonas Gralk! Effortlessly integrate 0-level mobs into your world! Or challenge smaller 1st level bands. Perfect for sandbox-style play as the content is easily extendable to support many sessions of deadly fun! 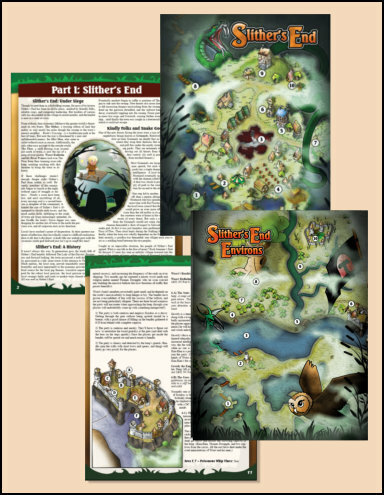 Encounter the decidedly quirky folk of Slither’s End and unearth clues about their troubles. First question: why does there appear to be giant pool of bubbling blood in the center of town? Battle unforgettable foes in the surrounding swamps, including Mist Men, axe wielding trees, pixies with bad attitudes, giant nut-bombing squirrels, and the return of the not-so-fearsome opossumen!